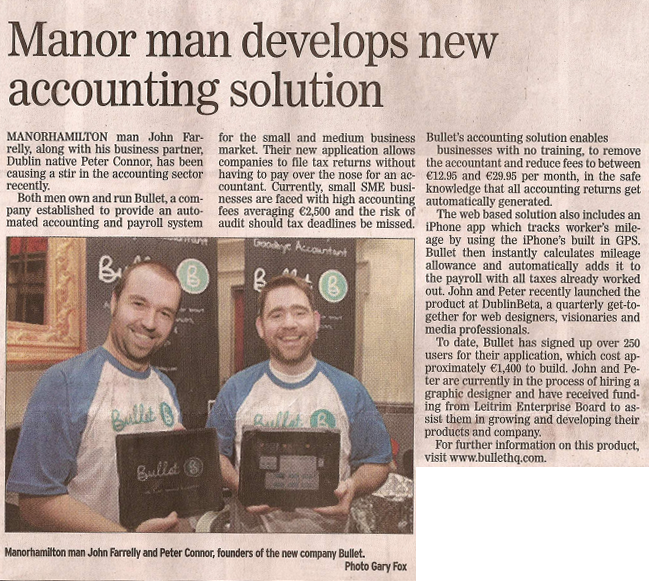 Manorhamilton man John Farrelly, along with his business partner, Dublin native Peter Connor, has been causing a stir in the accounting sector recently. Both men own and run Bullet, a company established to provide an automated accounting and payroll system for the small and medium business market. Their new application allows companies to file tax returns without having to pay over the nose for an accountant. Currently, small SME businesses are faced with high accounting fees averaging €2,500 and the risk of audit should tax deadlines be missed. Bullet’s accounting solution enabled businesses with no training, to remove the accountant and reduce fees to between €12.95 and €19.95 per month, in the safe knowledge that all accounting returns get automatically generated. The web based solution also includes and iPhone app which tracks worker’s mileage by using the iPhone’s built in GPS. Bullet then instantly calculates mileage allownace and automatically adds it to the payroll with all taxes already worked out. John and Peter recently launched the product at DublinBeta, a quarterly get-together for web designers, visionaries and media professionals. To date, Bullet has signed up over 250 users for their application, which cost approximately €1,400 to build. John and Peter are currently in the process of hiring a graphic designer and have received funding from the Leitrim Enterprise Board to assist them in growing and developing their products and company.